Nestled on the scenic Oregon coast just minutes from Pacific City, Sandlake Country Inn offers luxury and privacy rarely found. This 1894 shipwreck-timbered historic farmhouse is located in a country setting just 1 mile from the ocean. Large rooms await you with fireplaces, whirlpool baths for 2, luxury lotions and bubble baths, private decks and a sumptuous hot breakfast delivered to your door. For the ultimate in privacy, try the Cottage which is snuggled alongside our babbling brook. 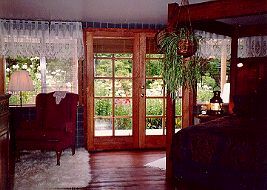 The Sandlake Country Inn bed and breakfast is perfect for romantic getaways and honeymoons. Sandlake Country Inn has been featured on the television series "Best Places To Kiss" on The Travel Channel. Included in various guidebooks and cookbooks such as: "The Best Places To Kiss In The Northwest", "America's Favorite Little Hotels and Inns", "Mobile Travel Guide" and "Fodor's". Romantic Country Inns, Getaways and B&Bs offer a great coastal alternative to big hotels.